First, the app does not collect, mine, harvest or do anything with your data. Firearm information is just as sensitive as your social security number or credit card information. Gun Log does use iCloud services if you activate them. Your data is synced to all of your iOS devices running Gun Log and that requires the data to be transmitted to those devices. Second, the app has a passcode. It is activated by using the iOS Settings App. Gun Log stores firearm inventory, ammunition inventory, and shooting results with the ability to share your information through copy/paste, email, and printing. Gun Log is meant to be used wth iCloud and "Documents & Data" turned for your devices. This will allow the data to automatically sync on all of your iOS devices. If you do not want or need iCloud storage and sync then consider Gun Log which has all of the functionality of Gun Log except iCloud. 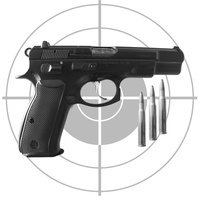 Gun Log is dependent on the service level and availability of iCloud services. Your data will be stored on iCloud servers. You should consider that. Units are only in yards and inches. There is no metric or other measurement system support. Warning This app is not compatible with version 5.9 or earlier with data stored in iCloud. You need to make a manual backup of your data by following the directions on the support site. With that backup you can then transfer your data to the new iCloud implementation. If you run the app and you do not see your data, do not delete the app, just follow the directions on the support site, the data is still there. Passcode (Use the iOS device Settings App to enable) Firearm Inventory Multiple Calibers per Firearm Photo (Firearm, Firearm Configuration, Accessory, Firing Set Target…) Purchase/Sale Information Maintenance Log Ammunition Log Firing Sessions Accessory Inventory Reports Email and Printing Ballistics Calculator Backup (via iTunes file sharing) iPhone/iPod Touch iPad iCloud Storage If you turn "Documents and Data" off Gun Log will make a new database and you will be able to use Gun Log without "Documents and Data" turned on. Any changes made while "Documents and Data" is turned off will be copied to iCloud if you turn "Documents and Data" back on. If you remove Gun Log from iCloud's managed data your data will be lost if you turn "Documents and Data" back on. Do not modify the database outside of Gun Log . Such actions are not tested and are not supported. Do not backup a Gun Log database and use it in Gun Log or Gun Log. The schema and design of the database is the copyrighted work and design of Slinkworks There are detailed tutorials and screen shots found on the support page. Gun Log versus Gun Log The differences are Gun Log can print and email reports, and sync your data across your iOS devices with iCloud, Gun Log cannot print, email, and does not use iCloud. Gun Log versus Gun Log The differences are Gun Log can sync your data across your iOS devices with iCloud, Gun Log does not use iCloud. Check these links to find your download for Gun Log +P for & iOS or for your device iPod TouchiPadiPhone. The app Gun Log +P is compatible with te following devices.